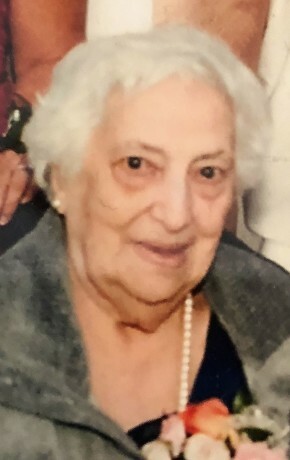 Antonietta “Nonna” Santoru of Warwick, NY (formerly of Edmeston, NY) passed away on February 5, 2019 at St. Anthony Community Hospital. She was 95 years old. Born in New York, NY to parents Francesco and Margherita (Cabras) Congiu on September 1, 1923. She was married to Mario Santoru who predeceased her in 2001. Antonietta is survived by her sons Joseph and his wife Barbara of Warwick, NY and Francesco and his wife Donna of Toms River, NJ; grandchildren: Joseph (Jennifer), Andrew, Allyssa, Hannah, Francesco and Lauren; great-grandchildren: Isabella, Julian and Rosalie; brothers: Pirri Congiu of Italy and Mario Congiu of Florida; sister Giovanna Nash of Flanders, NJ; and her cats: Uncle Ralph, Theo and Louie. She was predeceased by her parents, husband, and brother, Lorenzo. The family will receive friends on Monday, February 11 from 11:00 a.m. -12:30 p.m. at Lazear-Smith & Vander Plaat Memorial Home, 17 Oakland Avenue, Warwick with a funeral service at 1:00 p.m. at Christ Episcopal Church, 50 South Street, Warwick. Interment will follow the service in Warwick Cemetery. At the time of funeral service we commemorate and reflect on the life of Antonietta Santoru. In the days, weeks and months ahead it will be a comfort to family of Antonietta Santoru to continue to remember a life well lived. Please select a date on the Calendar of Care to be reminded via email to reach out and continue the caring for family of Antonietta.